The most important creatures of the Himmapan forest is probably the Garuda. 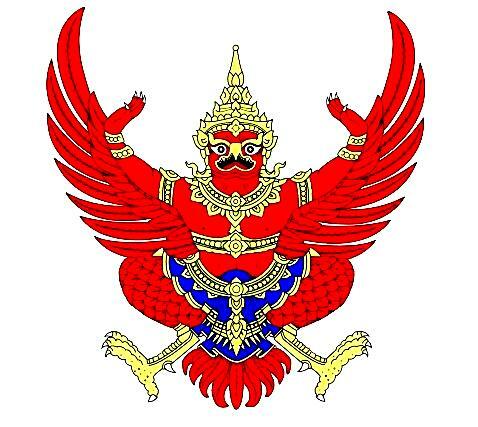 Garuda is the king of birds, half-man and half-bird, the vehicle of Vishnu, a Hindu God. Descriptions of Garuda vary from legend to legend. He usually represented as having the head, beak, wings, and talons of an eagle. With the torso like that of human. His face appears white, his wings red, and shiny golden body. Some texts, however, give different descriptions. Sometimes, he is described as having eight limbs, with six being human limbs, two are legs with strong eagle like claws. Another text says Garuda has either four or two limbs. When he shown with two limbs, he will be holding a Naga in each talon. 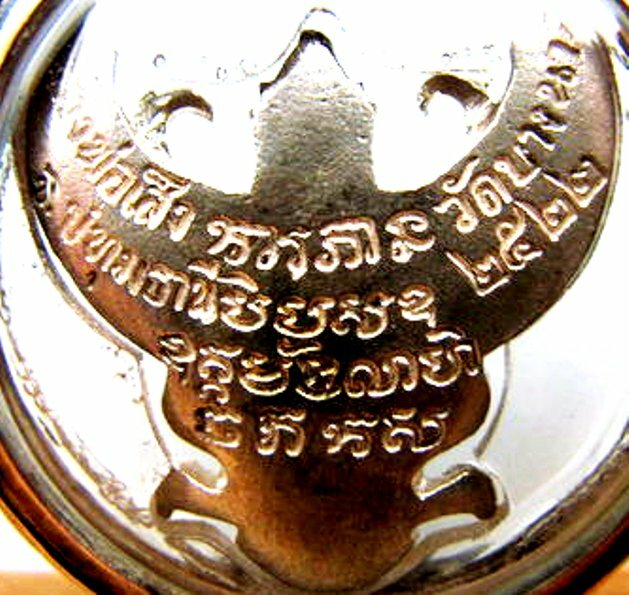 There are many Garuda related legends, some are derived from the Pali and Sanskrit literatures. The major Sanskrit literatures are the Ramayana, Mahabharata, and Puranas. The main Pali source is the Tripikata. 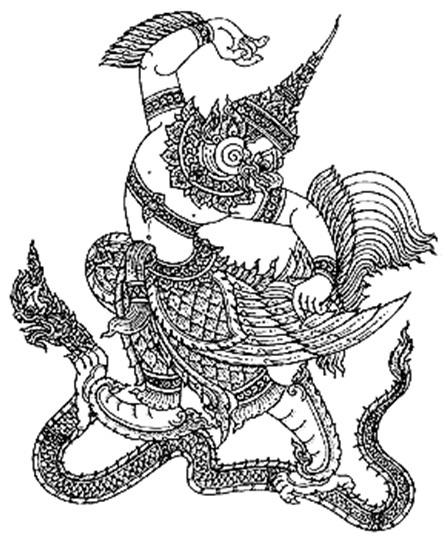 In the Sanskrit literature, Garuda is a son of Kasyapa. Legends says that Kasyapa was a powerful sage. He had many wives, two were his favorites. These two were sisters, Vinata and Kadru respectively. Kadru request a blessing from her husband that she should have a large number of children, eventually she gave birth to 1,000 Naga sepents. The Nagas chose to live underworld in the ocean depth. Vinata requested from her husband that she should have only two sons and should be more powerful than the children of Kadru. In time, she laid 2 eggs. Vinata waited for 500 years, but the eggs showed no sign of change. Vinata grew impatient to know what inside and broke one of the eggs herself. Inside the egg was a boy with a well-developed upper body but has no limbs below his torso. Knowing that his mother was the cause of his premature birth and the reason of his deformity, the boy was furious. He cursed his own mother that she should become a slave of her sister, Kadru, for 500 years. After casting the curse, he rose up high in the sky and flew away, and finally settled down as the charioteer of the Sun God, Surya (Suriya). 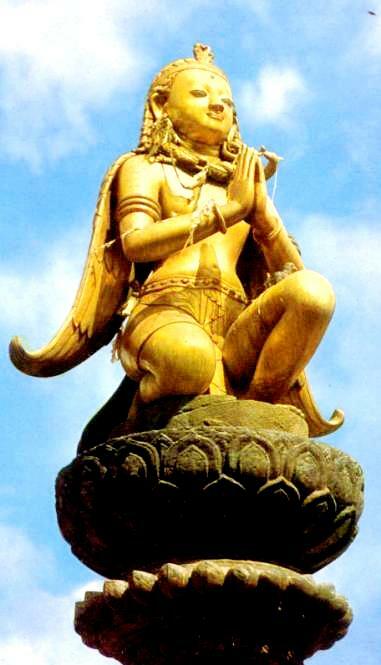 He was later known as Aruna (Arun). 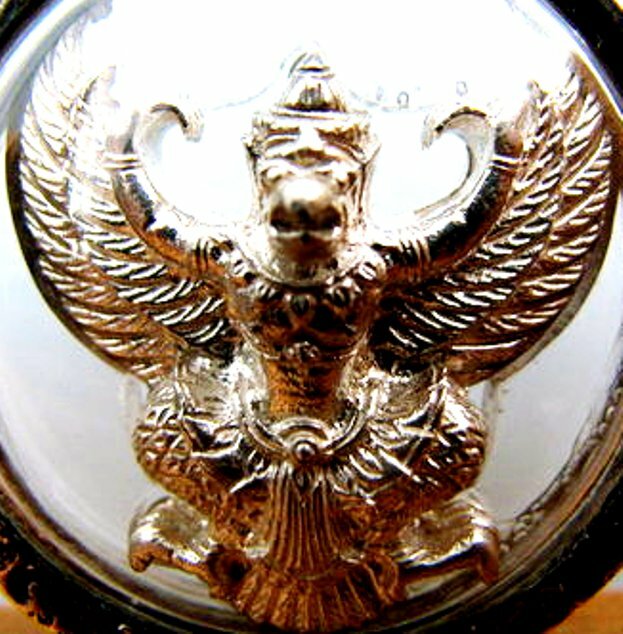 Vinata second egg finally hatched 500 years later, and out came Garuda. 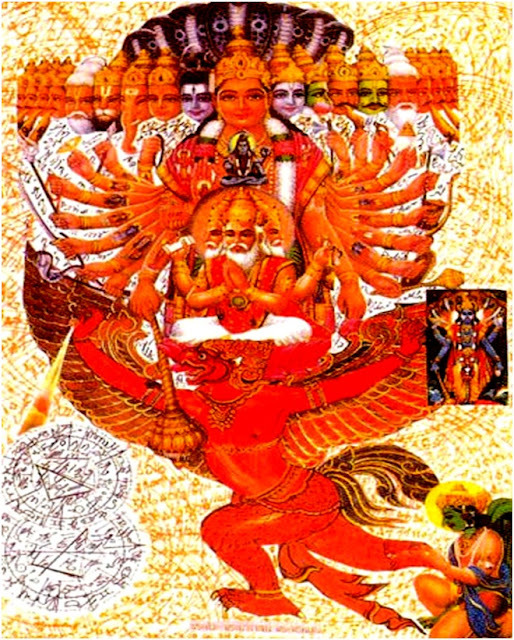 The body of Garuda expended so large in all directions. His top most part reached the sky. His body shone with brilliant lustre that many gods mistaken him for an incarnation of the god of fire, Agni. Vinata believed the horse was pure white in color. Kadru said it was grayish in color, hence the horse should have some strands of black hairs. Their quarrel led to a wager by which the loser would become a slave of the winner for 500 years. The horse was in fact pure white. Kadru knew it and didn want to lose the bet, she then ordered her Naga sons to assume the shape of horse hairs black in color and stick themselves alternating the real hairs to make the horse appear grey. The innocent Vinata lost the bet and became Kadru slave and was kept in custody underworld among the Naga population. Garuda found this out later from his mother about the cunning trick. He made up his mind to free his mother. Garuda negotiated with Nagas by bringing them the Amarita (elixir of immortality) in exchange for his mother freedom. He fought a troop of gods led by God Indra. But Garuda too powerful, even the lighting bolt, the most powerful weapon of Lord Indra, was broken. Garuda eventaully obtained the elixir of immortal. The fight intervened by the great God Vishnu (Narayana). The two are very powerful and no one can defeat another. The two then came to terms. Lord Vishnu gave Garuda a boon which made Garuda immortal, and promised him a higher seat than his own. 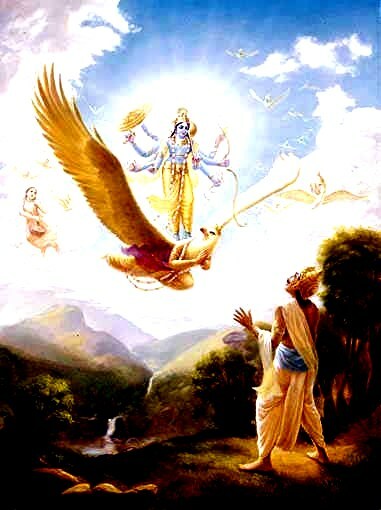 In turn, Garuda agreed to become the vehicle of Vishnu. Garuda planned a trick by asking Lord Vishnu to follow him secretly and take away the elixir after Nagas have released his mother. It the boon which Garuda obtained from Lord Indra (Some legends said from Lord Vishnu) that makes Nagas the natural food of Garuda. Generally, Garuda catches a Naga by holding the Naga with his talons and beak by Naga tail then split open the belly, eat only the fat and drop the body back to the sea.